Sign cartoons can be the perfect captionless cartoon humor. Remember the old song by Five Man Electircal Band “Signs, signs everywhere a sign…..”? After creating many cartoons relating to signs, I’ve archived many of them and offer this collection of sign cartoons that you can review at your leisure. I like to create cartoons that somehow make a statement rather than offer the so called “belly laugh” or guffaw. Sometimes cartoons that have a sign or written message in a sign are images that convey a direct impact on the reader. These are the kinds of cartoons that literally speak for themselves and make an indelible impact on the person reading them. They provide that “aha” moment. Signs are a part of the fabric of our society and can be a unique blueprint in creating future gag cartoons. 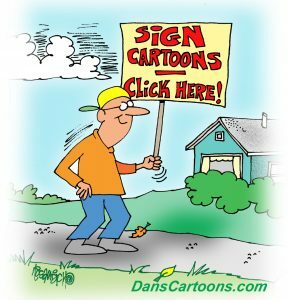 Bookmark this page of sign cartoons for easy reference and if you can think of a funny cartoon where a specific type of sign may boost the impact of the overall cartoon, feel free to mention it here. Put on your thinking cap and think along similar lines of the “Do Not Enter” signs you see on a piece of land or “Private Property – No Trespassing”…how can signs like these be improved for a future cartoon I would draw? 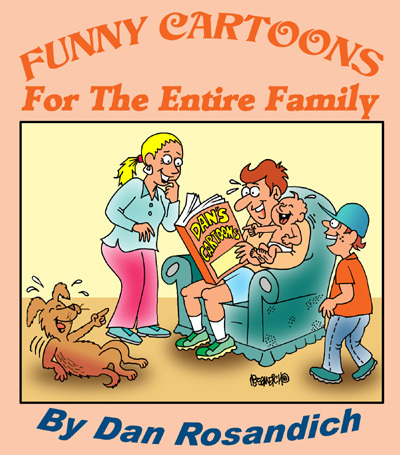 In fact, you may see a cartoon in this collection that is ripe for improvising. Offer your feedback and comments in the suggestion box below and I’ll give those suggestions some serious thought. There are other signs like “Student Driver”….can you envision that on a car with perhaps an old elderly gent trying to get his driver’s license for the first time? And maybe the driving instructor is sitting in the passengers seat all sweaty? How could that scene be improved? You can see, that conjuring ideas out of thin air isn’t as easy as you would think! There has to be a basis for the actual concept to work or appeal in a funny way. Feel free to have a laugh on my behalf with these images and if you have someone on your list that needs a good belly laugh, don’t forget I offer sharing buttons on the pages where all my cartoons appear and you also have the option to forward them by email directly. If you’re a professional who is seeking to license one of these cartoons, contact me for a licensing quote and be certain to tell me exactly how you’ll be using the cartoon.